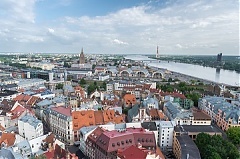 The Latvian capital city Riga has been included in the list of 20 European cities nominated for this year’s European Best Destination title, Live Riga representative Anna Blaua told BC. Latvia will not be able to meet all recommendations of the Council of Europe’s Committee of Experts on the Evaluation of Anti-Money Laundering Measures and the Financing of Terrorism (Moneyval) in due time, said Ilze Znotina, the head of the Latvian Office for Prevention of Laundering of Proceeds Derived from Criminal Activity (also called the Control Service), citing LETA. The Baltic Culture Fund that was put in operation at the beginning of the year will be accepting applications for grants until May 20, as the State Culture Capital Foundation's representative Jana Verdina told LETA. The growth in corporate equity slowed over the first three quarters of 2018. The yearly growth in equity was around 4% by the end of the third quarter, which is a little below the growth in corporate debt. A new chief executive officer of RB Rail, a Baltic joint venture that coordinates the implementation of the European standard-gauge Rail Baltic railway project, is likely to be named in February at the latest, chairman of the company's supervisory board Karolis Sankovski said LETA/BNS. Lithuania's bankrupt bank Ukio Bankas and Deloitte Lietuva, providing audit, accounting, tax, legal, consulting, financial and business advisory services, have reached an agreement in their dispute over the bank's audits, reported LETA/BNS.